You don’t need to spend a large amount of money on your phone to get great performance. We mostly hear about flagship devices in the media that makes us think that spending 600 bucks on a phone is normal. In reality, there are many fantastic mid-range devices available. 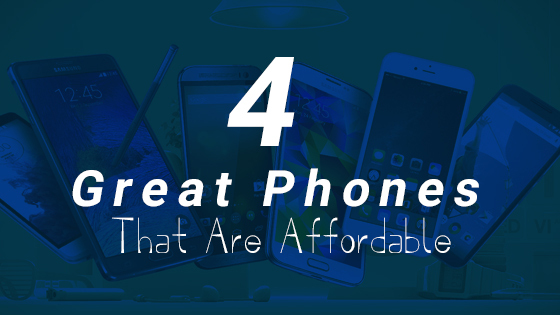 You won’t get all the features available on Galaxy S7, iPhone 7, or OnePlus One, but you still get very decent phones that will serve you well in day to day tasks. As you will soon see, you can pay half the amount you’d spend on these phones and still walk away with competent devices fit for any task. Yes, we know the name is very similar to Samsung’s Note, but this phone is no cheap knock-off. The phone is surprisingly cheap for all the power it offers in almost every area. Our favorite thing about the Redmi Note 3 is the battery. The 4050mAh battery packs enough power to take you through the day easily. You also get a 16 megapixel camera (and an HD front cam) plus 3 gigabytes of RAM. The Redmi Note 3 is a fantastic phone at a low price. We would highly recommend it to anyone who doesn’t want to spend too much on a top-of-the line phone. The Redmi Note 3 can do almost everything more expensive phones can. Samsung’s Galaxy series has many phones aside from the Note and S line, and they are much less likely to explode. The Galaxy J7 prime is a fantastic mid-range phone that delivers all that you can want. The 3300mAh battery provides enough juice to power the phone’s impressive features. You get a 13 megapixel camera and a full HD front camera. The screen boasts a 1080p resolution at 5.5”. The phone performs well, and the 3gb of RAM provides enough power to keep lagging away. Motorola really hit a home run with their G4 line. The Motorola Moto G4 Plus is an update over the plain G4 and costs slightly higher. The low price difference is easily worth it as the G4 plus packs more power. The most impressive part of this phone is the 4 GB of RAM. RAM is essential for a phone that doesn’t lag and the Motorola Moto G4 Plus may be the best phone in terms of RAM in the price range. It also has a 16 megapixel camera, a full HD front camera, 1080p 5.5” screen, and a 3000mAh battery. It seems like no one told Lenovo that they were making a mid-range device when they designed the Lenovo K5 Note because it is filled with excellent features you normally don’t get at this price level. At this point we think just having the ‘note’ moniker in the device name is a good way to know that it is going to be powerful. The K5 has 4 GBs of RAM and it makes a whole lot of a difference when it comes to running apps. It also has a powerful 3500mAh battery that provides enough juice for the phone’s powerful screen, camera, and processor. There are many other interesting devices available for even lower prices. Remember, even the lower-end of Android phones is good as long as you stick to reputable companies.